NORTHERN ALBERTA RAILWAYS, NAR. Operating Era: 1951-1980's. This Kit models NAR Car #20003. Northern Alberta Railway purchased 30 Fowler Boxcars from Canadian Pacific in 1951. These cars were renumbered #20000-20029 and rebuilt into stock cars by the shop crews at Dunvegan Yards in Edmonton between 1951-1953. After rebuilding, the cars were painted in the CP boxcar red over white paint scheme and operated as stock cars until the early 1970's. 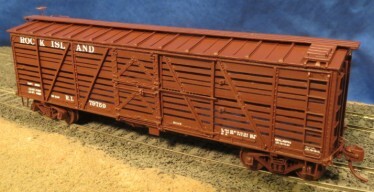 Around that time, the cars were converted into Material Car Service and painted solid boxcar red with various amounts of the side slats covered over from the inside. These NAR stock cars are unusual in that they differ in many ways from the Fowler stock cars rebuilt by CP and that almost every one is structurally different from each other. During their service lives, many cars were further modified, recieving different roofs, half drop grabs at the corners and, in some cases, ladders. Our Kits allow the modeler to reproduce many of the different versions of the NAR stock car. Options included in the Kit are Murphy 14/16 rib roofs, various side, end and corner gussets, tow versions of grab irons, ladders and two versions of the 5' Youngstown steel doors that were made into stock doors. These Kits also feature our New One-Piece Roof Frame (#1540). Decals are included that cover the life of the car on the NAR.